As a palaeontologist, I have the privilege to go behind the scenes in museum collections and rummage through cabinets and drawers, filled with incredible wonders from deep time. This gives me the opportunity to examine lots of fossils, from dinosaurs to ammonites to plants. From time to time, I’ll come across something that is unlike anything else I have ever seen (or read about). Something so odd that is must be new to science. 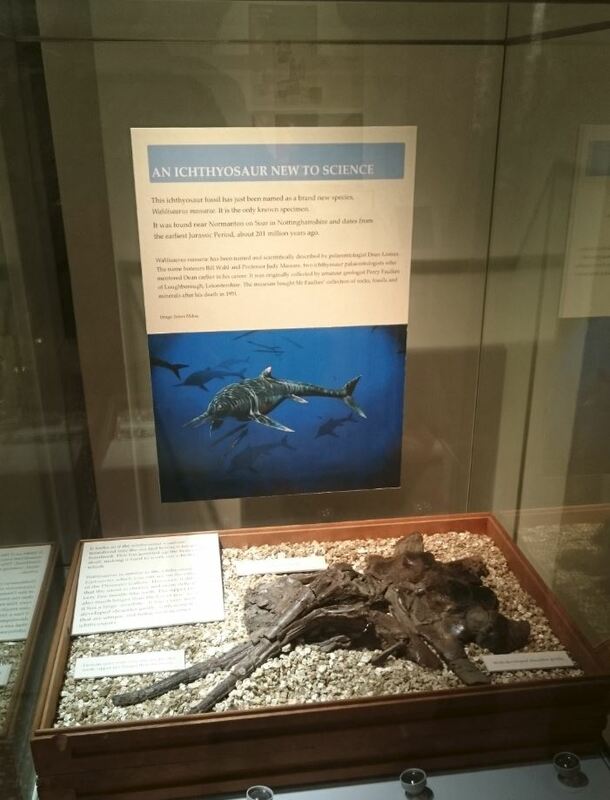 In late 2014, whilst accompanying a student on a collections visit to Leicester’s New Walk Museum and Art Gallery, the curator and palaeontologist (Dr Mark Evans), showed me an ichthyosaur skeleton. As soon as I set my eyes on this specimen I knew it was unusual. The specimen comprises a partial skeleton and skull, the latter of which is taphonomically distorted, probably due to a nose dive. That’s not some special ichthyosaur swimming technique, but what happened to many ichthyosaurs after they died. That is, after death, the body would have floated around for a while (if it evaded being eaten) and eventually sank to the bottom, often nose first = nose dive. The skull of this specimen, although damaged, was still very well preserved in part, with some articulation. 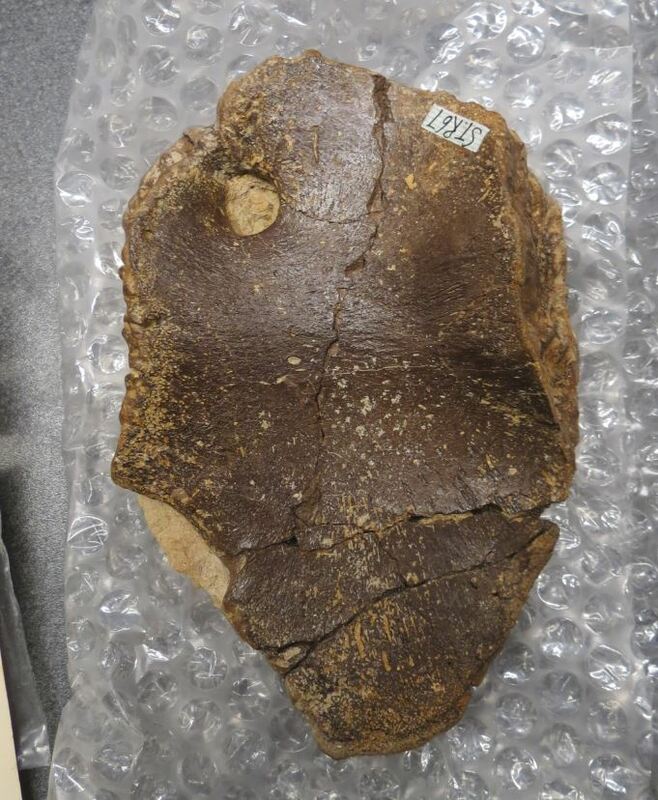 Elements of the braincase are even preserved. Moving passed the skull, the most important thing about this specimen, which is what I noticed immediately, is a ‘hole’ in the coracoid. I was quick to remember that only one other ichthyosaur is known to have a similar hole (= foramen) in the coracoid, a species called Cymbospondylus. That species, however, is Triassic in age whereas this specimen is Jurassic. Additionally, Cymbospondylus is very different to the studied specimen in skull and post-cranial morphology. Having spent several days studying the skeleton, I was confident it belonged to a family called Leptonectidae, which was defined by palaeontologist Michael Maisch in 1998. Known ichthyosaurs belonging to this family include Leptonectes, Eurhinosaurus and Excalibosaurus (yup, after the sword). They have long and slender snouts, which is one of the features shared by members of the family. Now that I had determined what family the specimen belonged, I had to decipher what exactly it was. Holotype of Wahlisaurus massarae on display at the New Walk Museum and Art Gallery, Leicester, UK. After studying the skeleton and comparing it with various leptonectids, either first-hand or from the literature, I decided that the specimen was a new genus of ichthyosaur. I wrote a paper on the specimen and it was accepted and published in the Journal of Systematic Palaeontology. I named the ichthyosaur Wahlisaurus massarae, in honour of two colleagues and mentors, Bill Wahl and Prof. Judy Massare. Both have significantly contributed to palaeontology, especially the study of ichthyosaurs, and I could not think of a better way to thank them by naming this new ichthyosaur in their honour. Their names will be set in stone forever. Pun intended! 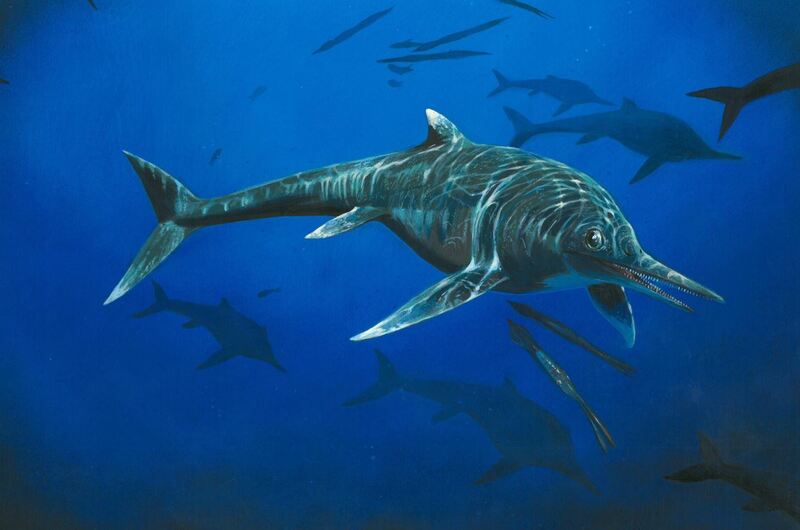 This was the first new genus of British Early Jurassic ichthyosaur named since 1986. Life reconstruction of W. massarae (Image credit: James McKay). One ‘issue’ with my study is that I had just one specimen. Naming a new species on the basis of one specimen can be problematic. See, for example, a new specimen of an existing ichthyosaur species might be found to have the same ‘unique features’ of Wahlisaurus. Other issues relate to completeness and preservation, i.e. the skeleton of Wahlisaurus is incomplete and, in some parts, poorly preserved, so perhaps that had ‘obscured’ the skeleton to make it appear unusual. This would mean that Wahlisaurus would simply show ‘variation’ of an existing species. However, as part of my study, I was very careful with comparisons and demonstrated that in no way could this specimen be an example of an existing species. Notably, the coracoid was very unusual from anything else that had been published before. It was clearly a genuine feature, found in both coracoids, and not the result of poor preparation, predation, or ontogeny. When my paper was published, based on the above, I was a little nervous to see what reception it would receive. At large, most comments were positive. However, I did receive some negative comments stating that it was just ‘variation’ of an existing species (Leptonectes) and that somebody will simply synonymise the two species in the future. Leptonectes is a species in dire need of a revision (anybody want to do that?!). I took the comments on board, but was beginning to question whether the decision to name this was correct. Was I wrong? In late 2016, I visited the home of friend and fossil collector, Simon Carpenter. 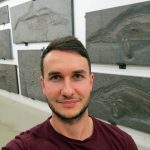 Simon is a splendid chap who has collected some wonderful fossils, including the holotype of the giant pliosaur, Pliosaurus carpenteri, also known as 'Deadly Doris', on display at Bristol Museum and Art Gallery. Whilst looking through Simon’s collection, I came across a specimen. Perhaps one of the biggest grins on my face then appeared. This was another specimen of Wahlisaurus massarae. It is an almost complete coracoid, which has exactly the same unique features as in the holotype specimen. You can imagine my excitement. It was quite a surreal moment, actually. When you have just one specimen, the ‘variation’ can be called upon, but when you double the number of specimens you have it gives even more credibility to your research. Almost complete coracoid of the new specimen of Wahlisaurus massarae, in the collections of the Bristol Museum and Art Gallery. The specimen was kindly donated by Simon Carpenter. This new specimen was collected in 1996, in a quarry in northern Somerset. It is an important specimen, not only because it is the second example of Wahlisaurus, but because it is the first example known from Somerset. It is also from the Triassic-Jurassic boundary, right after a world-wide mass extinction. Although Simon had all of the data regarding when/where it was collected, we were unable to determine exactly whether the ichthyosaur was latest Triassic or earliest Jurassic in age, although it is roughly 200 million-year-old. This new discovery also led to another examination of the holotype specimen. I asked Mark Evans if he could clean the bones and remove additional rock from the holotype, which he was able to do. This assisted in a detailed re-examination of the original skull, especially the skull roof, which led to the discovery of additional bones. This provided for a better understanding of the skull structure and a comparison with the skull of Leptonectes. To round up this little article. The feeling one gets when uncovering something new to science is quite incredible, in fact you cannot quite explain it. You are the only person to have figured out a mystery and for a moment in time you are the only person that knows this. The basis of science, of course. Indeed, new discoveries, big or small, are each important in their own right. The discovery of the second specimen of Wahlisaurus has helped to add further credibility to my identification of Wahlisaurus massarae as a distinct ichthyosaur. Hopefully, more complete remains will one day turn up. Maybe one with a few embryos. One can only hope. The study was published in the scientific journal, Geological Journal. 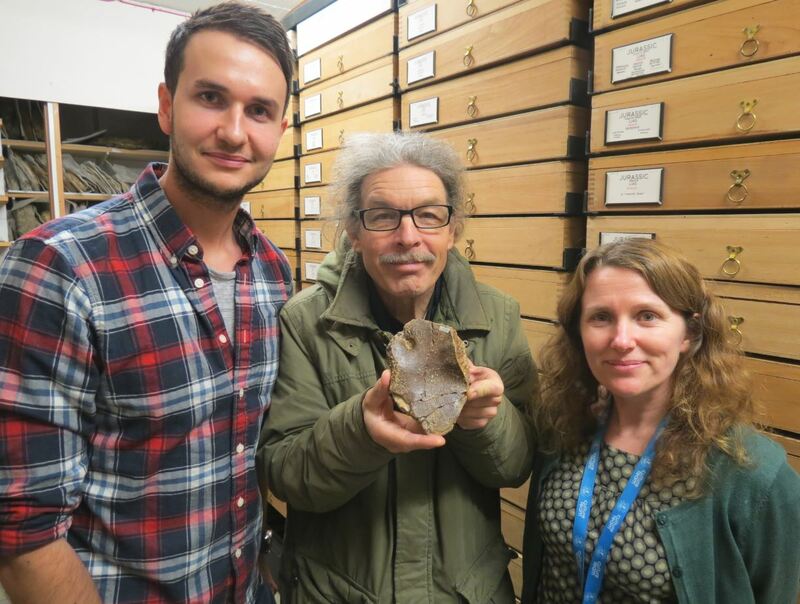 The author (left), Simon Carpenter and the new specimen (centre) and Debs Hutchinson of Bristol Museum (right) (Image credit: Nigel Larkin).